Dental Implants can be an option if you have one or more missing teeth. If the missing space is not filled, the teeth surrounding the space often drift, the opposing teeth in the other arch will erupt further into the oral cavity which can change your bite, bone erosion can occur in the area, and even changes in speech might occur. The implant replaces the tooth root and actually integrates with the bone, forming a strong bond to the jaw bone that provides a stable foundation and a permanent replacement to the missing tooth. 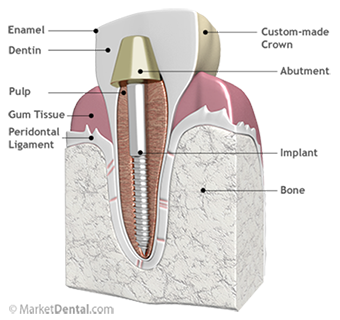 Your implant will look and feel just like a natural tooth, allowing you to chew and speak normally. After thorough assessment and evaluation, dental implants can be placed by a dentist using local anesthetic and then allowed proper time to heal so that they actually become part of the jaw bone. Once the healing stage is complete, the patient returns to our office for the process of receiving their final restoration. The restoration is designed to match the patient’s teeth, and is often as strong as the patient’s own natural teeth. This overall process can take four to six months for most patients, depending on their oral health. If you are looking for an experienced dentist in Toronto for implants restoration, please give Yonge Dentistry a call at (416) 489-6955 to schedule a consultation with our dentist.